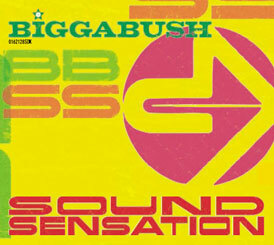 To celebrate the release of his "Sound Sensation" mix released at the end of last year on Stereo Deluxe, Glyn "Bigga" Bush, the man who releases so many reggae and dub-influenced stuff of the highest quality under so many guises, offers not a track, not a mix, but ONE track and TWO mixes for your listening pleasure. If funk, dub, reggae, latino and hip hop are your thing and you enjoy spreading some electronic dub textures and production on top of those, then go listen! Glyn "Bigga" Bush is an independent non-aligned producer and DJ based in the South West of England. His two main projects BiggaBush and Lightning Head reflect his love of dub reggae, Brazilian rhythms and Afro-Cuban beats and he has produced two albums "Studio Don" (Best Seven/Sonar Kollektiv) and "BiggaBush Free" (Stereo Deluxe) as well as many remixes (Tapper Zukie, Tosca, Up Bustle & Out). His DJing style is also eclectic, taking in virtually any style of music with the emphasis on original and un-formularised, from jungle to boogaloo, from dub to breakbeat. He is a regular at the UK's Big Chill festival and plays club dates across the globe, particularly in continental Europe but more recently in Japan and the USA. In addition to DJing he leads a 10-piece percussion group, the Magic Drum Orchestra, which plays a similarly wide range of grooves including samba, batucada, samba reggae, afrobeat, bembe, dancehall and funk. As one half of legendary Birmingham based outfit Rockers Hi-Fi, Glyn "Bigga" Bush redefined musical history and independent dancefloor business more than just once during the 90s. Constantly exploring the infinite and thrilling space between deep dub vibes, soulful musical tradition, up to date electronica and the grooviest global beat flavours stayed Bigga's mission even more so after Rockers Hi-Fi split up a few years ago. Following the path of his highly influential solo ventures under the Lightning Head moniker, Bigga Bush released the prophetic "Biggabush Free" album on Stereo Deluxe in 2004 and earned a huge amount of love and respect among fans and critics around the world alike. Glyn's ever growing fascination for and deep knowledge of the irresistible grooves & patterns hailing from South America and Africa add that certain extra feel and surplus kick to both his original music and his dj performances. A very organic musical fusion of vintage & new, north & south, slow & fast, east & west as well as analogue and digital: Bigga Bush has a lot to say in every way (see also his personal comments on the individual tracks of this selection at the bottom of this info). With this crisp and unique selection now, Bigga once again showcases his rare gift and special ability to stay ahead of time both musically and spiritually. No big names or the usual compilation suspects found here – prepare yourself for a big bunch of hand picked, potential past & future classics from around the world in the mix instead! Almost two decades of dj skills as well as a brilliant taste and feel for musical moods definitely qualify the man to provide this ultimately soulful compilation, sure to be among the best and most interesting of not only this year. By including a string of exclusive mixes and reworks as well as incorporating various personal edits and special treatments, Bigga Bush easily manages to transform his vision of adult dancefloor and eclectic home listening into a highly inspirational, classy and very personal mixtape that others would definitely kill for... out now on Stereo Deluxe! "This mix reflects my wide taste in music and my ever-expanding (free)style of DJing. You will hear the sort of tunes that make me want to make music and the type of tunes that make me want to dance. For me DJing is the meeting point of these two desires."